Heavy is the head that wears the crown: Gliding delightful on cross-country skis through the wintely landscape, exploring the off-piste terrain on snowboard or skis or carving with elegant swings through fresh powder snow. Professional equipment, adjusted to individual skill level and personal driving needs, is required, in order to enjoy winter activities to their fullest. INTERSPORT Lackner, next to the 8-seat cable car Hochbrand is worth a visit: The experienced team of INTERSPORT Rent knows about the latest technical tricks and tunes the proper rental equipment optimally to your needs. The INTERSPORT Rent employees know the little things that decide whether your skiing day turns into an eventful success. 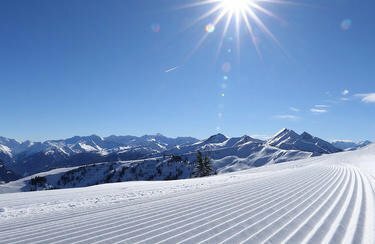 Let us induct you into the art of carving at INTERSPORT Lackner, nest to the 8-seaat cable car Hochbrand: While you can cope flat slopes on all-round carving skis, the freeriding carver provides more boost and better torsional strength on more inpracticable terrain. The cross-carver is suitable for rapid skiers who want to prove their skills on steep slopes. You need professional advice to keep track of the abundance of high quality winter sports gear? The INTERSPORT Rent team in Großarl is at your service! Das Team ist äußerst freundlich und kompetent. Wir werden natürlich nächstes mal wieder unsere Schi bei euch ausleihen!! !